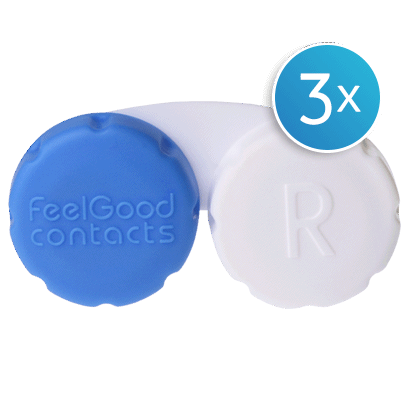 Add the Feel Good Contact Lens Case Triple Pack to your contact lens cleaning routine and enjoy a handy compartment to store your two weekly or monthly contact lenses. This triple pack of contact lens cases will help you look after your soft or rigid gas permeable contact lenses for months on end. This handy eye care accessory can be used for contact lens cleaning and storing for a multitude of products. When using a multi-purpose contact lens solution, simply fill up a Feel Good Contact Lens Case with fresh solution and add your pre-cleaned contact lenses to soak overnight. In the morning, you’ll be sure of clean lenses that feel fresh and comfortable to wear. Alternatively, you can also use the Feel Good Contact Lens Case contact lenses with a hydrogen peroxide solution. To ensure no disinfectant remains on the lenses after cleaning, you’ll need to add a neutralising tablet to the case. This way you can be sure your lenses are free from potential irritants and are safe to wear. Also suitable for contact lens rinsing using saline solution, this multipack of contact lens cases offers everything you need to look after your lenses. After each use, remember to scrub and rinse your contact lens case with fresh solution to get rid of any leftover product. With contact lens cases needing to be replaced every three months, this handy multipack offers the perfect storage unit for your lenses for up to nine months.